I write this post on the eve of a giant blizzard said to be the worst storm we’ve seen in years in the Maritimes. It’s a lovely way to welcome Spring. Yes, Spring: according to the calendar it arrived 5 days ago. Mother Nature says otherwise. While she will be happy when Spring does come, it will bring with it challenging times, – as does any season change for our kids on the spectrum. But let’s look at why. If you live in a climate where you are lucky enough to have four seasons, each season lasts about three months give or take. Just long enough to get used to things being a certain way. Stop for a moment and think about each season and our senses. Visually, each season looks different, trees lose leaves, grow leaves, flowers bloom, snow falls, then we get the yucky dirty snow on the side of the road. All of these things make your surroundings look drastically different. We have only one possible route to daycare, a very routine drive that passes the same houses and signs on the road. As we go through season changes, MJ will get very disoriented on this drive, and will begin to get overly anxious telling us this is not the way to daycare. Everything smells different as the seasons change. Some of these seasons, like Spring, bring allergies for some, which can stuff up our noses and make things that normally smell a certain way, smell different. And then of course there is temperature. As our weeks warm or cool, we need to wear different kinds of clothing. When we wear less clothing, the air feels differently as more skin is exposed to the air than when we wear more clothing. The clothes also rub, which creates issues on its own. Lastly let’s not forget about the time changes for those of us ‘lucky’ enough (hear the sarcasm?) to live in areas that observe daylight savings time, coupled with more or fewer hours of daylight. “Why am I going to bed when it’s still light out? Why am I am waking up when it’s dark?” Here’s a video that explains how this can relate to increased behaviours. When you look at all of these factors, you can see why the changing of a season wreaks havoc on those who are very routine-focused or rigid in their behaviours – EVERYTHING is different. I touched briefly on clothing above, but instinctively knowing what clothes to wear based on weather patterns is not an easy task. We also posted recently about the need for specific instructions to be provided when helping your child get dressed for the day. Sabrina has also posted about challenges with sequencing as part of a conversation. All of these play additional roles in the complex challenges of dealing with seasons. To understand when seasons change, you need to also understand what months belong to which seasons and in which order seasons come in, so you can begin to understand what types of clothing might be appropriate for the various weather changes. 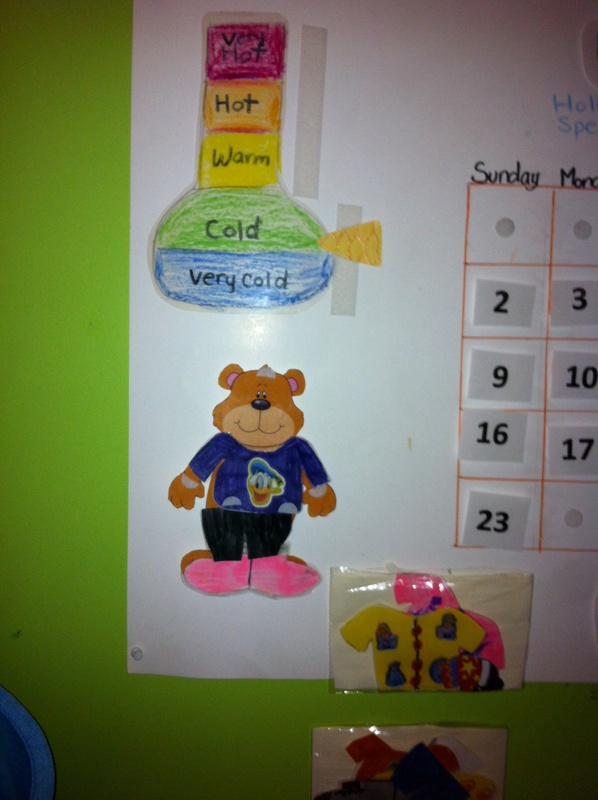 Our weather boards allow our kids to dress the weather bear. In our house, MJ has named him Toots and we had fun making our own clothes, colouring and decorating them. We have also added a thermometer to our boards that helps colour code exactly HOW cold or warm it is on a day. This feature helps MJ understand that Toots needs more or less clothing based on the temperature. Just using a weather wheel, however, was not enough because it can be sunny in the winter or the summer. So sun alone is really not a good indicator of what to wear. We needed to be able for her to understand sun in relation to the actual temperature outside. In order for the weather board to work, MJ had to understand days of the week and “months.” MJ’s therapists worked on teaching MJ to recognize how many days there were in a week and weekdays vs. weekend. 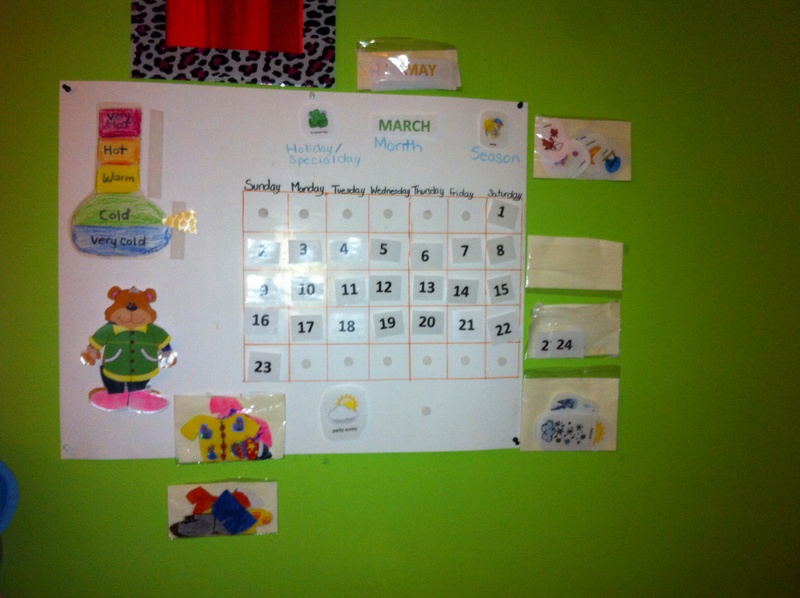 This was done by creating targets to teach her one day of the week and/or month at a time. First, showing her a picture of the word Monday and saying it was Monday. Then they moved on to putting out several days of the week/months and asking her to identify where Monday was. Once she had this down pat, next came learning how to put these in order. This was done through more visual matching and songs. Since she knew how t o count, they could then layer in teaching about the actual numbered days of a month and so on. Then we moved on to understanding or matching what months match which seasons. We have even begun to layer in special days or holidays that occur and what they mean (which is another post entirely). This board has been very effective for us; each morning I tell her what the weather will be like and she adds the graphics to her boards and then chooses clothes for Toots. Once that is done, she will choose her own outfit. After a few weeks of this, we begin to see recognition dawn as she chooses her clothes. She’s beginning to pick outfits that are appropriate for the weather – and fighting less over wearing scarves, hats and mitts. Because she loves science, she’s even beginning to ask us questions about weather and the elements. She even noticed one day recently how some clouds look different than others and realized it might have to do with the kind of weather (e.g. precipitation) that may or may not be expected that day. So I’m looking forward to expanding on that interest in the coming weeks! There are many other things I have not touched on in this post, which include how we arrived at the pockets that hold each of the different card groupings for the board. MJ, like most kids on the spectrum, have difficulty with perspective, which again is a whole other post. Originally we had little envelopes tacked up (with pictures of what was in each) but found MJ had difficulty knowing to look in the envelopes for the right image if she couldn’t see it right in front of her. She’s not a digger. If there’s a toy box, she’ll pull out the top toy; she doesn’t understand that she can dig through it and that there are other things in the toy box. We have gotten rid of anything resembling the traditional toy box and use open bins with visual labeling. Now she can find the things she wants to play with more often than not, without having a meltdown when Mommy can’t come help her look RIGHT NOW. So I took some Ziploc bags, cut them to size and inserted cardboard inside to help reinforce the plastic and then tacked them up to the wall with those 3M Easy strips. I even broke the numbers out into two groupings, 1-15 and 16-31 so there were fewer numbers to dig through each day. Being able to see all the options for each category seemed to help immensely. With Spring maybe approaching, consider trying a variation of a weather board. Depending on your child’s skill levels, you could start with something simple and work up to a more complex version as their skills emerge.